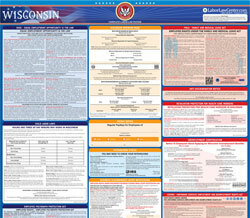 The Notice to Employees about Applying for Unemployment Benefits (Spanish) is an unemployment law poster by the Wisconsin Department Of Workforce Development. This poster is mandatory for some employers, including all employers who covered by wisconsin's unemployment insurance law and who employ spanish-speaking workers. This poster, written in Spanish, must be posted in a conspicuous place by all employers so Spanish speaking employees can see it. This poster describes how to qualify for unemployment and what information is needed to apply. It appears you don't have a PDF plugin for this browser. Please see the link below to download wisconsin-ucb-7-s-p.pdf. comienzo de su año de beneficios. ¿Cuándo se Aplica? ¿Cómo Aplicar? un formato alternativo, incluso traducciones a otro idioma. primera semana en la cual usted queda desempleado. No espere que la semana termine. 2. Lea y acepte los Términos y Condiciones. Beneficios de Desempleo en línea. extranjero, numero de documento y fecha en que caduca.